This intimate, local restaurant provides traditional home-style Italian food with a huge menu and fantastic value for money. A Beautiful Venetian mural, and star-like ceiling lights decorate this restaurant and each table is candle lit creating a romantic and relaxing atmosphere. The first restaurant in the chain was called " Pizzeria Venezia", and was opened in 1997 at Earls court London. The Fulham branch was opened in 2002. 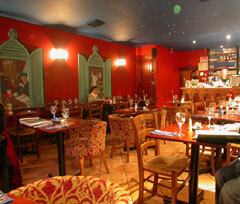 However you will be happy to know that the head chef here has over 20 years of experience in Italian cuisine. The restaurant can be exclusively hired on request and can cater for up to 48 people. The menu choice is wide - from a la carte to buffet and drinks only. There is a private function rooms that can accommodate up to 15 people. All food and sauces are prepared fresh everyday at Cafe Rialto and reputable Italian suppliers supply their Italian wines, beers and all other authentic ingredients. The menu is a good mix of meat, fish and vegetarian choices.